Senior advocate Kapil Sibal, representing Roy, said it was quite difficult to raise money as the properties have already been attached. The Supreme Court on Tuesday asked embattled Sahara Group chief Subrata Roy to deposit Rs 1,500 crore (Rs 15 billion) in the Sebi-Sahara refund account by September 7, saying it may then deliberate upon his plea seeking 18 months more time for making complete re-payment. A bench headed by Justice Dipak Misra rejected the plea of senior advocate Kapil Sibal, representing Roy, that the proceedings to start the auctioning process of the Rs 34,000 crore (Rs 340 billion) worth Aamby Valley property by the official liquidator of the Bombay high court be put off till September 7. Roy had earlier undertaken before the court that he will deposit Rs 552.21 crore (Rs 5.52 billion) by July 15. However, Sibal at the outset, informed the bench, also comprising justices Ranjan Gogoi and A K Sikri, that out of Rs 552.21 crore, Roy has deposited Rs 247 crore (Rs 2.47 billion) and the balance amount of Rs 305.21 crore (Rs 3.05 billion) will be deposited by August 12. "It is directed that the respondent-contemnor (Roy) shall deposit Rs 1,500 crore which would include the balance amount of today by September 7. After due consideration, we have granted time till September 7, though Sibal, with all humility at his command, prayed for fixing the date some time in October 2017," the bench said. Meanwhile, the bench extended its earlier order granting parole to Roy and fixed the matter for hearing on September 11. 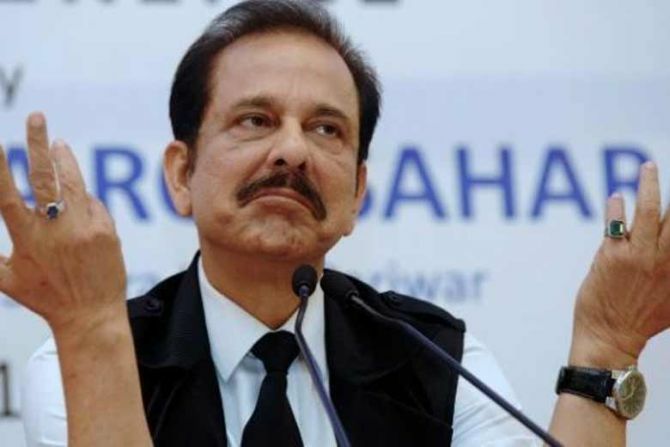 The bench, which has approved the draft sale notice and terms to dispose of Sahara's Aamby Valley properties, said, "the official liquidator shall publish the sale notice as given by him and the notice shall be published on August 14. The steps which are required to be taken for the publication of the sale notice are allowed. "The amount that is required for publication shall be given from the Sebi-Sahara account. Pratap Venugopal (appearing for Sebi) shall see that the moment the official liquidator produce a letter, the amount shall be released to the official liquidator." At the outset, Sibal and senior advocate Mukul Rohatgi, appearing for one of the Sahara companies, assailed the apex court's judgement in the case and sought 18 months time to re-pay around Rs 9,000 crore (Rs 90 billion) balance amount of the principal amount of Rs 24,000 crore (Rs 240 billion). Sibal said it was quite difficult to raise money as the properties have already been attached and the companies are not being allowed to do their business and sought 18 months time to re-pay the entire money. Rohatgi urged the court that the previous order stopping the Sahara firms from doing business be modified. The plea was turned down by the bench. "Whether 18 month is reasonable or lesser time than that has to be debated. The issue, as presently perceived, is the bonafides of the respondent-contemnor (Roy) and that can be spelt out or translated by action and the action is deposit of the dues in Sebi-Sahara account," the bench said. "Though we appreciate the humble submission but we are not in a position to accede to the same. The grant of time, without any steps taken by them would tantamount to giving indulgence. Indulgence has the propensity to give rise to procrastination which is the murderer of justice. "Therefore, we are disposed to think that the first two steps for sale of Ambey Vally project shall be undertaken within this time and for the same, we approve the draft sale notice submitted by the Official Liquidator and direct him that he shall take first two steps by updating the dates," the court said. At the outset, Sebi's counsel told the court that the remaining amount to be deposited was around Rs 9,179 crore (Rs 91.79 billion). "What is troubling us is that if we will accept deposit of money in this form, it will be very difficult to say as to when the entire money will come," the bench told Sibal. Sibal, however, said according to them, the remaining amount was around Rs 8,000 crore (Rs 80 billion) and they have made all efforts to deposit the money. "We are not running away. Please allow us to do business so that we can earn revenue and pay back the money. Bare assets are of no value until I develop it. Once I will develop it, it will be of enormous value," he said, adding that the remaining amount was "safe" as the apex court has already attached Aamby Valley properties. Senior advocate Shekhar Naphade, who is assisting the court as an amicus curiae, said for developing properties, Sahara will have to enter into agreements with developers. The court then said it will not allow this. When the bench asked the official liquidator about the process and time schedule for auctioning of Aamby Valley, Sibal said, "Why the court is so keen on Aamby Valley now?" During the hearing, Sibal said for last years, he has been seeking to argue the case as there was no investors to whom money was due and questioned the ongoing proceedings relating to refund of money. "Sebi-Sahara case is different. We will examine whether investors are real or have come from moon," the bench said. On being asked as to whether money has been paid and what is the proof to substantiate, Sibal said "how did this court arrive on the conclusion that money has not been paid?" Roy has spent almost two years in jail and been on parole since May 6 last year. The parole was granted the first time to enable him attend the funeral of his mother. It has been extended since then.